Order books have opened for the new Volkswagen Amarok Pick-up, with first customer deliveries expected in January 2017. Replacing the previous model’s 2.0-litre TDI engine, the new Amarok has a 3.0-litre V6 TDI engine - making it the only six-cylinder model in the segment, says VW. The top-of-the-range version of this new engine delivers 224 PS and 550 Nm of torque channelled through its standard eight-speed automatic gearbox, giving a top speed of 119 mph and a 0 to 62 mph time of 8.0 seconds. An overboost function on the 224 PS takes the power up to 240 PS. Further iterations of this V6 TDI engine include a 204 PS version which is available to order at launch with an automatic gearbox, plus a manual 204 PS and a 163 PS manual to follow later in 2017. Combining what Volkswagen describes as ‘car-like comfort’ and technology, full off-road capability is available either as selectable (with manual gearbox) or permanent (with auto) 4MOTION four-wheel drive, while an optional mechanical rear-axle differential lock is also available for demanding off-road use. From the outside the Amarok features new front bumper and radiator grille design including front fog lights, new alloy wheels and a third brake light with LED technology. Inside the cab, the changes include an all-new dash panel design which incorporates Volkswagen’s MIB infotainment system with touchscreen, radio and new technology including the option of navigation, Guide & Inform, Car-Net and App-Connect systems. Bluetooth and DAB digital radio are also now standard. Standard safety equipment includes four airbags, an Electronic Stabilisation Programme and Automatic Post-Collision Braking System. Additional highlights including Park Pilot and a rear-view camera also enhance comfort, convenience and safety. Three trim levels include the Startline - available later in 2017 - through to the Trendline and Highline. Special editions will also be offered, for example a range-topping Aventura, of which only 240 examples will be available, is on sale now. It adds, on top of the Highline’s equipment list - which includes items such as bi-xenon headlights with integrated LED daytime running lights - special features including 19-inch alloy wheels with 255/55 wide tyres and arch extensions. The bed of the Aventura’s cargo box also has a matt black Durabed coating. The interior features a ‘Discover Media’ navigation system and mobile online services. The Aventura also comes with ParkPilot automatic parking system, featuring front and rear parking sensors and a reversing camera. This model is available in an exclusive Ravenna Blue metallic paint finish. 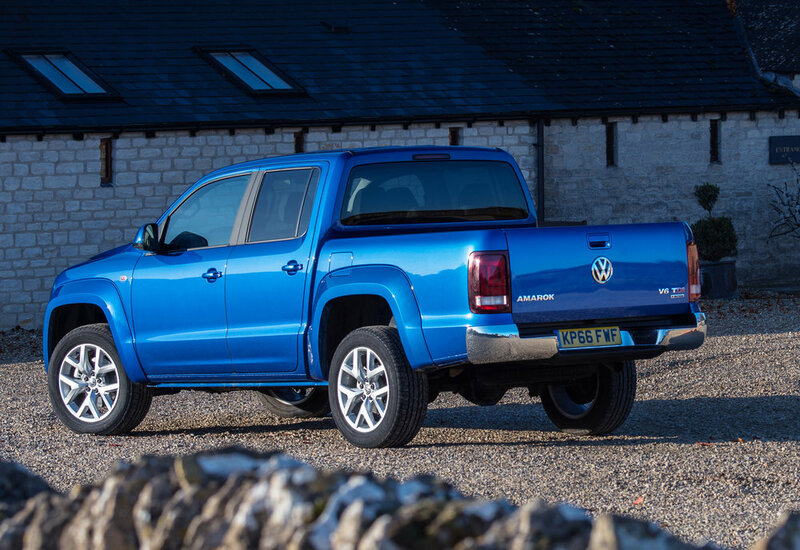 Prices for the new Volkswagen Amarok start at £32,493 OTR for the Trendline with 204 PS. The limited edition Aventura launch model costs £39,381 OTR.